Would you be able to drive carpool? 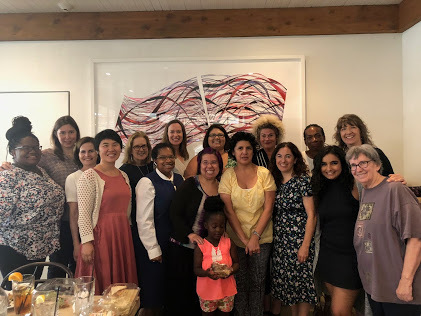 USC WIM Board members attended the annual transition lunch held in July to honor outgoing members, to welcome incoming members, and to kick off a new season of empowering the women of USC! This year we ventured to the Artist’s District’s Zinc Café. Board Members Leonette Williams and Bernice Taylor were honored for their service as they step off the board. Leonette Williams has been a part of USC Women in Management since its inception forty years ago. She served various roles over the years and returned to serve the past four years as WIM’s Vice President, ensuring that the HERS Institute scholarship continues well into the future. We welcomed new board members: Dana Coyle, Karen Escobar, Victoria Esquer and Janet Schmidt. As a group we talked of being grounded and powerful as individuals and coming together as a community of like-minded individuals to continue to provide our members the strength of this organization. We discussed the desire to include more members in the creation of events via subcommittees to brainstorm the upcoming year’s programming. We noted that our mission “to empower the women of USC” remains as it did since the inception of Women in Management in 1979; however, what is our vision? Members agreed it had to do with creating a cohesive leadership program, connecting with senior leadership, developing deeper relations with other organizations doing similar work within our university and throughout higher education. We agreed that getting feedback of members-at-large as how to even better serve us all was critical. The organization was not offered by the institution; it was a community created by like-minded, forward-thinking individuals who felt compelled to come together to make the changes they sought and were needed. Let us continue to follow the need and to offer a platform that will propel women to the highest levels of responsibility at USC. Let us build a network of like-minded women who will support and empower each other at every level of the institution. Let us all take ownership of the positions we hold and lead at every level. The board looks forward to serving us all as we head into the 40th celebration of this organization that has served the women of USC since 1979! WIM Past-President and incoming Member-at-Large, Stacy Patterson goes solo in her one-person show at the Hollywood Fringe Festival with shows running now through mid-June. A Reasonable Fear of Tubas explores what scares us, whether real or imagined, in human or fish form. If we are all afraid of something (and we are, right?) then what might life after facing our fear look like? Perhaps, it’s a bit more reasonable. In addition to her work as a Program Manager in the School of Cinematic Arts, Stacy is a producer, storyteller and coach. After earning her BA in Fine Arts with an emphasis in theatre from the University of New Mexico, Stacy moved to Los Angeles and began working in film and television production and local theater. This is her first Fringe Festival though. Oh, and she’s seriously, (and often) hilariously scared of sharks, so she doesn’t get to the beach much. Are you a WIM Member with an event, or talent, to share? Contact Shu Li to be considered for our monthly Member Highlight. Celebrate WIM Membership in June! Celebrate WIM membership on June 21, 4:30-7pm, (HSC) and June 28, 2-3pm, (UPC). Come for a few minutes, or stay for a while. We look forward to reconnecting with you all! The Women in Management (WIM) annual “State of the University” luncheon drew attendees from across USC campus locations to the Davidson Continuing Education Center last Thursday for a chance to hear from Provost Michael Quick as well as Senior Vice President of Finance Jim Staten, and University General Counsel Carol Mauch Amir. Provost Quick recapped the recently updated strategic plan, and discussed USC’s dedication to diversity and inclusion. He also shared USC’s record-breaking number of undergraduate applicants this year – almost 64,000 applied, leading to USC’s most exclusive freshman class incoming this fall. Carol Mauch Amir discussed her journey at USC, and noted that the number of incredible women in management positions has continued to grow over the years. She celebrated the accomplishment of USC Village opening, and highlighted upcoming projects the university has underway, including the Coliseum remodel, and USC’s involvement in the 2028 Olympics to be hosted in Los Angeles. Jim Staten reviewing the university’s financial accomplishments over the past year, and shared plans USC intends to implement to face ongoing challenges, like those posed by recent federal and state legislation regarding tax reform. As in previous years, the leaders addressed the crowd in a brief Q&A that allowed attendees to ask their own questions. 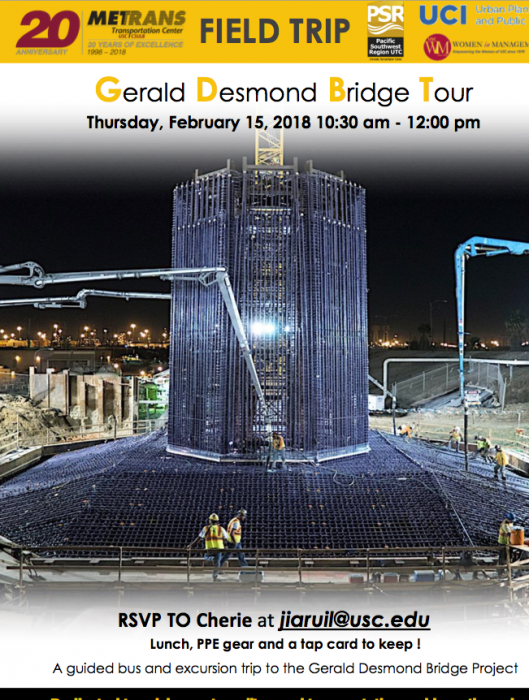 WIM Members– you are invited to join the METRANS group on a field trip of the Gerald Desmond Bridge Tour on Thursday, February 15, 10:30am-12:00pm, courtesy of our UPC Speaker Series Chair, Vicki Deguzman! 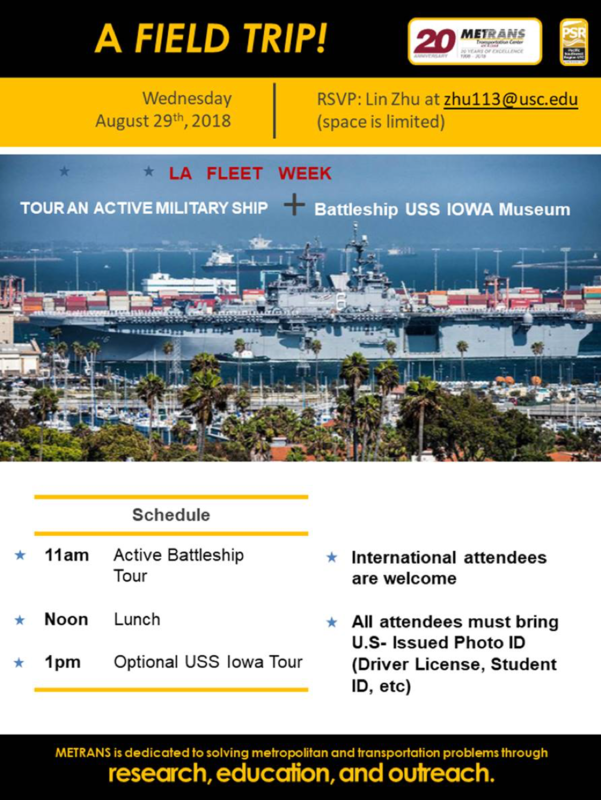 Please RSVP to Cherie at jiaruli@usc.edu, if you would like to attend. Having a professional headshot for your online profile or website is an essential piece to your personal marketing success. 87% of recruiters visit a candidate’s online profile before bringing them in for an interview. LinkedIn profiles with a professional headshot are 14 times more likely to have their profile viewed. You are 36 times more likely to receive a message on LinkedIn if you have a profile photo. The Headshot Truck is the first mobile photography studio in Los Angeles, New York, and Atlanta. You may have seen their big pink truck around town or on television. Recently featured in the New York Times, ABC, and CBS, The Headshot Truck specializes in personal and professional branding headshots. They are offering our members a 10% discount on any of their corporate packages! The Headshot Truck parks in different neighborhoods around the city 2-3 days per week. Click the link below to see the truck dates and locations throughout the month! You can book your appointment online and a Headshot Truck staff member will be in touch to confirm your time. Use promo code WIM10 to receive 10% off your package!